Operation Farm is a community organisation in Tameside promoting engagement, involvement and enjoyment of food and growing. We improve wellbeing and share skills through community events, course, learning session and activities. Orchards can be wonderful spaces right at the heart of the community and they are part of our environmental heritage. They’re a focal point where children can play and explore, where wildlife can thrive and we can use their fruit to make tasty puddings or as a lunchtime snack. The land that is now Hyde Park was once rolling countryside and latterly the home of the Newton family. In 1897 it was handed over to the people of Hyde for use as a park, a place where people could rest and breathe fresh air away from the smog of the mills and factories. Today the park is a much loved and well used local resource and in 2010 a community orchard of 44 fruit trees was planted with a grant from the Connecting Communities Fund, which also funded a beehive in the park. In 2012 the orchard was further improved when Operation Farm secured funding from the Big Lottery Fund’s Community Spaces programme. Guided by the priorities of local people, the project installed an outdoor classroom with beautiful mosaic paving design, a unique entrance feature, bespoke seating and banquet-style picnic table, a wildlife trail as well as information panels to explain all about the orchard came to be and how orchards support biodiversity as well as provide fruit for all to enjoy. A wildlflower meadow was also planted by children from local schools. If you visit the orchard, look out for mosaic motifs designed by local school children which represent the wildlife that orchards can support. Get involved! 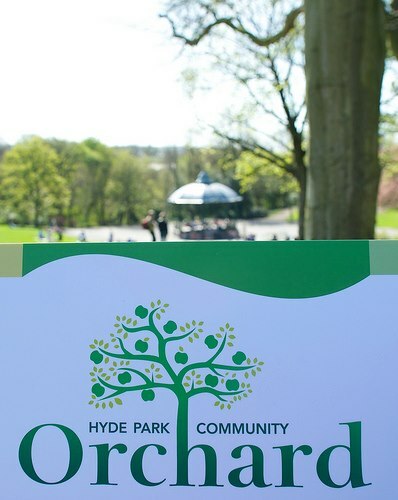 Join the Facebook group: Friends of Hyde Park Community Orchard. Join the Operation Farm committee!